Earlier this year, I had the privilege of staying at The Novotel Bangkok Ploenchit Sukhumvit. It is a four-star hotel located along the Sukhumvit commercial road. Which makes it easy and convenient for anybody to get around Bangkok by train and road. With the BTS SkyTrain – Ploenchit Station strategically located right in front of the hotel made exploring the Thai capital super easy! Also, we were right opposite Central Embassy - a shopping mall, which is one of the newest malls around Bangkok which I personally love for the touch of westernized décor and it has plentiful of F&B outlets to choose from. Checking in was a breeze. 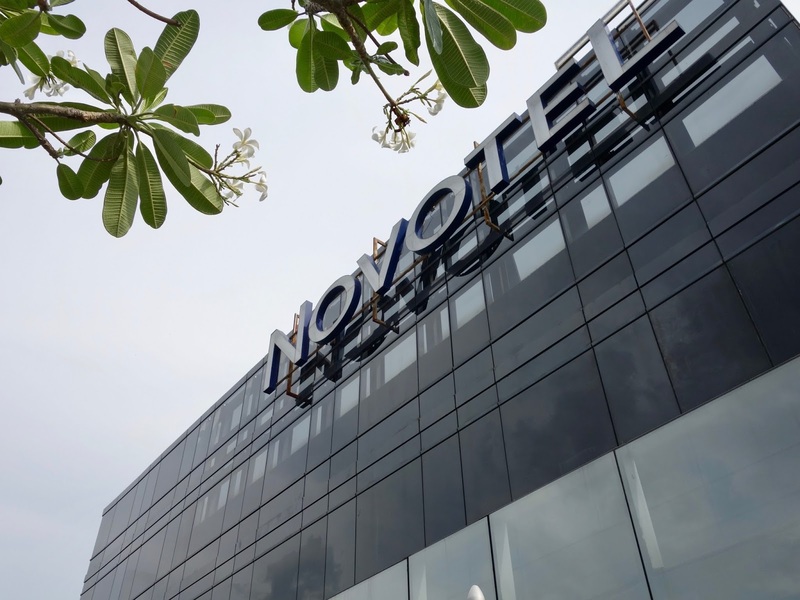 The lobby has a beautiful Novotel Bangkok Pleonchit Sukhumvit features 370 guest rooms along with outstanding facilities and amenities including restaurant and bar, fitness centre with sauna, outdoor swimming pool, and free Wi-Fi throughout. Being welcomed with friesh fruits and condiments was a very special intimate touch which the sister and I did not expect. It definitely made us feel very welcomed. With the warm glows of the sun rays through the windows, it was nothing but cosy and relaxing. The beautifully modern designed spacious rooms are to meet everyone’s needs. It was very comfortable and same goes with its perfect bedding and detailed touches that make all the difference. At Novotel Bangkok Ploenchit Sukhumvit, you can relax, get some work done and take full advantage of your time during every stay. If you opt for the Premier, Junior Suite and Suite rooms, you are allowed access to the Premier Lounge which is located on the 29th floor. Might I add, they’re so WORTH IT! Relax and unwind after a day of shopping and exploring the city of Bangkok by kicking back at the Premier Lounge. There’s also an indoor and outdoor seating area. Some of the benefits and highlights are Private check-in and check-out which you can get done at the Premier Lounge, Complimentary pressing of TWO garments on arrival, Breakfast at Premier Lounge (with free option at The SQUARE), Free evening cocktails and all day complimentary refreshments. In more detail, I am talking about - personalized service and exclusive privileges from evening bites, free flow alcohol which starts from 5pm to 7pm where you can enjoy a variety of beer, wine and whisky! Food served during these hours are amazing! Novotel certainly did not cut back on spoiling their guests. From Smoked Duck to fresh salad, varieties of cakes and desserts, pizza, spring rolls – you’ll be spoilt for choice! TIP: Opt for outdoor seating for an amazing view of the sunset! Beautiful hues of purple and dusk pink falls throughout the skyline of Bangkok while below you get to see the hustle and bustle of city life. I dropped by for dinner and on that night was their ‘Seafood Unlimited’ buffet. At only THB 1499++, I was spoilt with choices of fresh fish in forms of sashimi to grilled and so on. Able to cater a large group of people to a table for two, you’ll be amazed how roomy this restaurant is. Plus, I love how the waiters were really helpful after seeing me – a petite girl carrying two plates on her own stopped and helped me with ‘em! The Chef was even kind enough to create this beautiful maguro rose for me! Well I was definitely filled to the brim after my dinner there – FOOD COMA. Which I ended up back in my room rolling on the comfy bed and sheets till my friends stopped by to get me for a night out in town. If you feel like you had to much to eat or drink, fret not! Stay In Balance at Novotel Get fit and re-energize at the In Balance fitness centre with sauna rooms. Gym facilities where you can schedule a session with their in-house Personal Trainers or enjoy the sauna rooms with day beds and a shower. As mentioned earlier, every aspect of Novotel Bangkok Pleonchit Sukhumvit is meticulously decorated to suite every guess needs by oozing the ultimate cosy yet functional facilities for everyone. Be it on a business trip to a family or even couple getaway, you have it all here. You can also relax at the outdoor swimming pool. Which is located on the gym and sauna. Convenient, easily accessible through different modes of transport, strategically located in the hub of the city but not right smack in the middle meaning less congestion. Beautifully decorated interior which oozes comfy relaxing vibes while modern minimalist design flows through the hotel. Bars and restaurants are good enough to chill at that I didn’t even find the need to leave the hotel. One of the best sunsets views I’ve seen and of course, last but not least, friendly and accommodating staffs!